Half way down Finkle Street and on the North side of the street, a small cafe can be found, with two large arched windows. This building was the fire station, opened in 1838, and the base for three hand pumped fire engines. The building was orignally called Fire Engine House, and is part of the same building that used to house the police station. Hi. 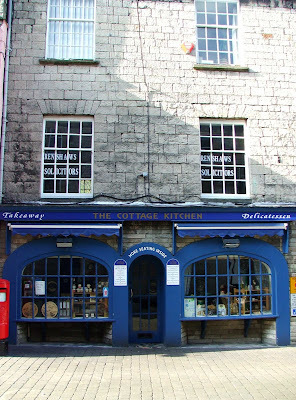 I came across your blog while searching for information on Kendal's historic police stations. I'm completing a novel set in the Kendal area in 1927, and need a brief mention of the station. Can you tell me where it was located about that time, and what the building looked like (in very general terms.) I realize this might be asking a lot, but as I have no other source, I'm giving it a shot? Though I'm American, I had the great privilege and pleasure of visiting England (including Cumbria) two years ago. I adored it. I would love to return, though financial circumstances (and the terrible state of the dollar) will probably prevent it for some time. The north of England is a particular favorite of mine; I especially loved visiting the Roman ruins, including the various fortresses and Hadrian's Wall. And of course the Lakes are wonderful.